Tune into “Jeopardy!” today when Mr. Peabody, the world's smartest dog, will be the first canine in history to host a full category on "Jeopardy!”. Mr. Peabody is a worldly dog and his WABAC time machine has given him the opportunity to meet many historical figures, so he is sure to have some tough clues for his category titled "Mr. Peabody & Sherman". In celebration of this “Jeopardy!” first we have a few promos of Mr. Peabody and Sherman traveling to 1830 and 1984 with Alex Trebek and his mustache! 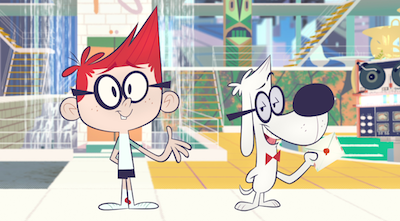 "The Mr. Peabody & Sherman Show" premieres on October 9th, exclusively on Netflix. Set in their swanky penthouse apartment atop beautiful Templeton Tower, Mr. Peabody and Sherman take late night television to a hilarious new level in the first animated talk show for kids! Complete with a “live” studio audience, special guests, and plenty of lights, camera, action, music and laughs, kids will be cracking up the moment Mr. Peabody and Sherman hit the stage.